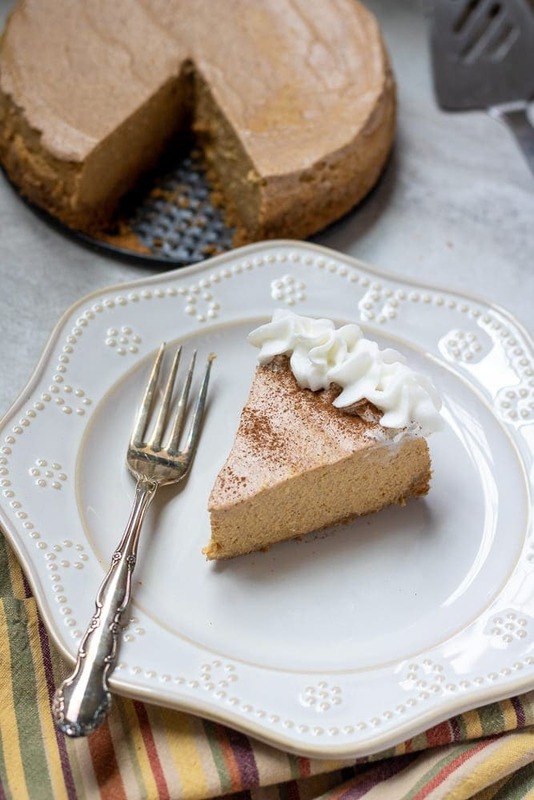 Instant Pot Pumpkin Cheesecake: The pressure cooker is the perfect vessel to create a creamy, rich Pumpkin Cheesecake made with a Gingersnap and Pecan crust. There is something magical about pumpkin cheesecake. In my opinion, Pumpkin is one of the BEST versions of cheesecake out there. In fact, I even think it is safe to say, I would take this over pumpkin pie any day of the week and it is perfect enough to finish Thanksgiving Dinner. By using a pressure cooker, Pumpkin Cheesecake is not only easy to make, but it also is tastier than traditionally baked cheesecake. 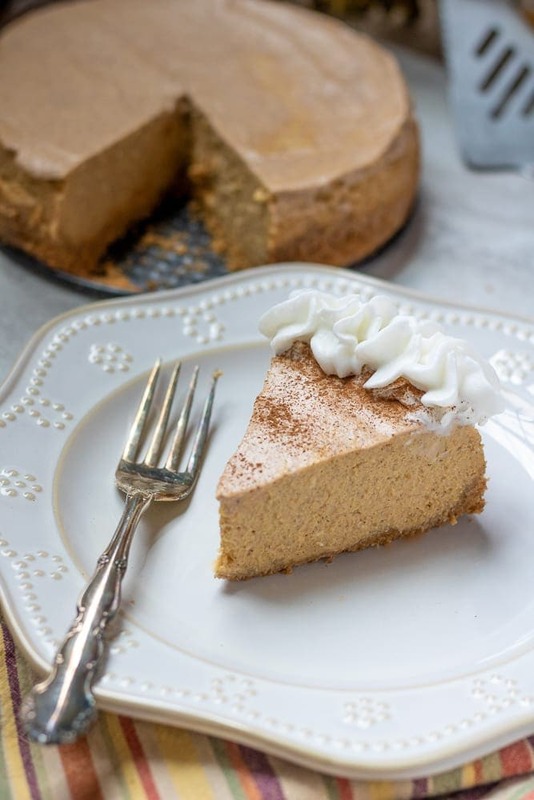 Because of the moist heat that the Instant Pot uses to cook with, this pumpkin cheesecake is baked in a delicate environment that preserves it’s creamy texture and bakes the cheesecake evenly–making YOU look like a rock star. Ginger and pumpkin are a perfect match and the kick from the ginger cookies really adds dimension to this cheesecake. In the food processor, pulse the gingersnap cookies and pecans until they are broken down into crumbs. Add in the melted and butter and pulse until the crumbs are wet and resemble wet sand. Press the crust down into a 7 inch spring-form pan. Place crust in freezer while assembling cheesecake filling. Alternatively, you can bake the cheesecake crust at 400 degrees for 10 minutes if you would like a crunchier crust. This pumpkin filling is creamy and spiced to perfection. Start by setting all your ingredients out 3-4 hours BEFORE making your cheesecake. Room temperature ingredients are essential so a smooth and uniform cheesecake. Beat together pumpkin puree, cream cheese, eggs, sugar and spices until creamy and smooth. Remove gingersnap crust from freezer. Pour Pumpkin Cheesecake filling unto crust. Gently tap down cheesecake on counter to remove air bubbles. Place 1 cup water in bottom of pressure cooker. Add trivet to inner pot of Instant Pot. Set to cook on high pressure for 30 minutes, or 35 minutes for a denser cheesecake. Release any remaining pressure and remove cheesecake from Instant Pot. Absorb any condensation on the surface of cheesecake by lightly dabbing it with a paper towel. Let cheesecake rest for 10 minutes. Run a knife around edges of spring form pan and carefully loosen outer ring. Cover Cheesecake with parchment paper or wax paper (to prevent moisture from forming on cheesecake) and then wrap in foil or plastic wrap. Best if eaten after 8-12 hours of being refrigerated. Like all cheesecakes, this pumpkin cheesecake tastes best if made at least 8 hours in advance. Pumpkin cheesecake will keep in the fridge for 4 days or can be frozen up to 30 days. Be sure to use fresh nutmeg for optimum flavor. If you would like to exchange the sugar for maple syrup, be sure to use pure maple syrup, NOT artificial maple syrup. Use 1/2 cup maple syrup instead of 2/3 cups. This pumpkin cheesecake calls for 100% Pumpkin Puree, NOT pumpkin pie filling. If you don’t care for gingersnaps, use graham crackers in their place. You can also omit pecans for a NUT free Pumpkin Cheesecake. A 7 inch pan is the perfect size to fit inside a 6 or 8 quart pressure cooker. For cheesecake, I like to use a spring form pan, but if you don’t have one, a 7 inch stainless steel cake pan will work. Use mini pot holders to remove your cheesecake from the pressure cooker or craft a foil sling by taking a 20 inch piece of aluminum foil and folding it three times length wise. Carefully center the filled pan on a foil sling and lower it into onto the rack in the pressure cooker. Fold the foil sling down so that it doesn’t interfere with closing the lid. It is best to have all your ingredients at room temperature BEFORE preparing the batters for the cake and cheesecake. This step is crucial to a SMOOTH cheesecake. When opening up your lid on your instant pot after baking your cheesecake, do so carefully so you don’t have condensation drip down onto your baked pumpkin cheesecake. If condensation occurs, the BEST thing is to blot up moisture with paper towel. The pressure cooker is the perfect vessel to create a creamy, rich Instant Pot Pumpkin Cheesecake made with a Gingersnap and Pecan crust. Process gingersnaps and pecans in food processor into crumbs. Add in melted butter and combine until the crumbs have been moistened with the butter. Press gingersnap crust into a 7 inch cheese cake pan. Place crust in freezer while preparing the cheesecake filling. Beat together cream cheese, pumpkin, egg, sugar, vanilla, and spices until creamy and smooth. Place the trivet into the Pressure Cooker. Pour 1 cup of water of into the pressure cooker. Place the pumpkin cheesecake on the trivet in the Instant Pot. Seal the pressure cooker and set to cook on high pressure for 30 minutes. (Hit manual button and adjust until time reads 30 minutes.) If you would like a really dense cheesecake, cook for 35 minutes. Once cook time has elapsed, allow pressure to release naturally for 10 minutes. Release remaining pressure and remove cheesecake from Instant Pot. Allow pumpkin cheesecake to cool and the refrigerate for 8-12 hours before serving. If you don't care for gingersnaps, use graham crackers in their place. You can also omit pecans for a NUT free Pumpkin Cheesecake. This pumpkin cheesecake looks absolutely delicious! Thanks so much Marsha. I hope you enjoy! I really need to try an Instant Pot dessert and this is going to be my next project – perfect for the season! Loving pumpkin right now. You will LOVE it Lucy! The way an instant pot cooks cheesecake can’t be beat. Do you know if you can use a glass dish? I try to avoild aluminum and don’t have a stainless cheesecake pan. Hi Nikki! A glass pan will work, you just may have a harder time slicing and removing from your dish. I’ve made this twice now, and it’s been a huge hit! Very tasty and simple, simple, simple! Thank you. WAHOO!!! !I am so glad you enjoyed this cheesecake Kristi! It is sure to be a huge hit for Thanksgiving! If you were to omit the pecans, would you just substitute extra gingersnaps? Hi Diana! You need 1 cup gingersnaps + Pecan combo, use any ratio you like, just keep in mind the more pecans you use, the more crumbly the crust will be. Enjoy!! I’m going to make this for Thanksgiving and decided to do a test run today. Everything was going to plan until I took the lid off my Instant Pot after doing a 10 minute natural release and saw that there was water on the top of my cheesecake! A small pool of water. I used paper towels to soak it up, and it looks ok, but any idea why the water was there? I will be sure to address this issue in the post. This pool of water CAN happen when you remove lid if the condensation falls from lid on cheesecake. It can also happen at times when cooking in moist heat (aka pressure cooker) You can cover your cheesecake with foil, but I prefer to cook without covering cheesecake for best consistency. Anyways, you did the BEST thing by plotting up with paper towel. It should set up perfectly. Enjoy! You’re right, it set perfectly and was delicious! I just made it a second time and had another water-related issue. I decided I wanted more crust with my cheesecake, so I doubled the crust and put it up the sides of the springform. I only waited 2 minutes for the natural release bc I was wondering if that’s when the condensation had set in last time. When I took the lid off, I saw that some of my side crust had gotten very wet — in fact, some of it had dissolved on the bottom of my Instant Pot. Other parts of my side crust were very gummy and looked gross. I have decided to scrape off most of the side crust and will try to add it back from a fresh batch of crust I’m about to make. Wish me luck! Hi Kiki! I am confused, did you cook the crust without the filling? If so, that would be why your crust got gummy, it needs the protection of the filling. Hi There. I followed the instructions and set timer for 30 minutes. After rereading I saw that the previous synopsis states to set pressure cooker for 40 minutes. Which one would be correct? I’m half way through so I’m hoping the 30 minutes is correct. Hi Brian, great catch! You are to cook for 30 minutes. Let me know how it turns out for you! I hope you love it!